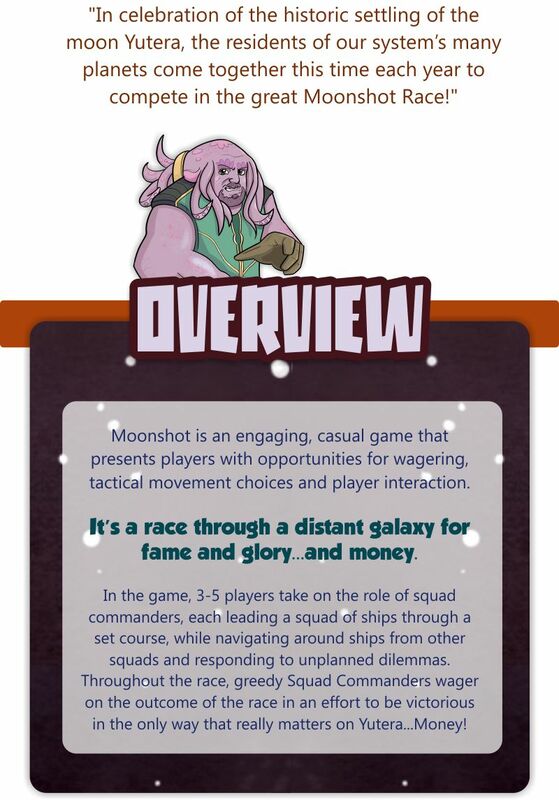 Moonshot, designed by brothers David and Micah Abelson, places 3-5 players in a race through a distant solar system, with the goal of having their squadron reach Yutera, a distant moon, first. This dice-driven, casual board game sets players at odds with one another as they jockey for position, often leaving opposing squadrons heading back to the starting line, to lick their wounds and begin again... As if that isn't enough, Squad leaders often bet on the outcome of the race! Wait Till You See How it Looks Now!! Moonshot has been through many changes since its conception. These are some of the early versions and the players who enjoyed it! David is a High School Teacher with a degree in Marketing and over 20 years experience in Printing, Promotion and Graphic Design. David was self-employed for nearly ten years before moving to Charlotte in 2013, to spend more time with his family. He was re-introduced to tabletop gaming in 2013 and has been mesmerized by the industry ever since. "We were near-fanatical about board games growing up. I couldn't get enough of Monopoly, ...Life and Scrabble and other games like Stop Thief! Board Games have grown up, and so have we. It has been an amazing few years of discovery, beginning to learn about modern board and card games!" David hopes that Moonshot is only the first of many games to be designed or published by Fisher Heaton Games and he looks forward to the excitement of expanding his design knowledge with every challenge. Micah is an Aerospace Design Engineer with 20 years of experience. Having worked on the initial designs of the Delta IV launch vehicle, and the F-35 Lightning II, he currently works as a Design Manager on the James Webb Space Telescope. Micah has also been an avid video gamer his entire life, playing various gaming systems going all the way back to the Commodore 64 and Atari 2600 and moving into PC games after getting his 1st PC in 1990. A fan of board games growing up, he was re-introduced to board gaming in recent years. "There are many aspects of game design that I am interested in. They range from the math and probability behind different kinds of dice mechanics to the ways that asymmetric games are balanced." He is looking forward not only to the publishing of Moonshot but to the completion of other games in development that will allow him to expand his game design knowledge even further.